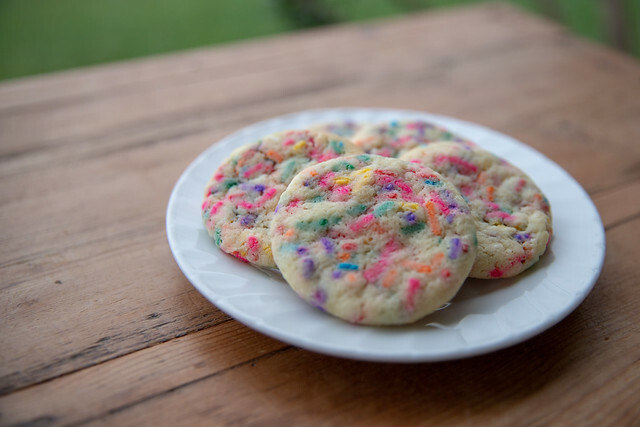 Funfetti is FUN - I mean, it's in the name! My Bonus Kids Alison, Rosie, and Emily came to Los Angeles to celebrate their grandmother's 100th birthday recently. 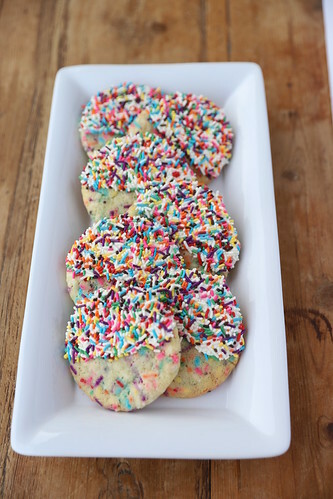 Pastry Chef Rosie came to my house to bake the desserts, and she made these fun and delicious cookies. Lucky for me (and you), she left her recipe and I made a batch for work. 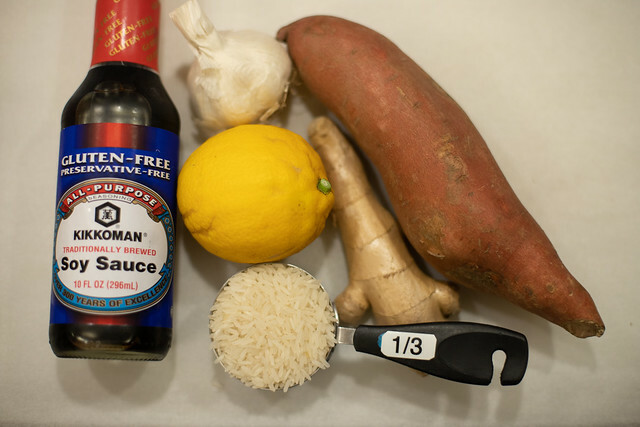 Here are the ingredients. 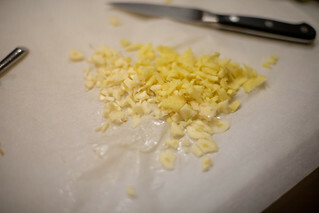 In order to soften the butter quickly, chop and lay on a piece of parchment. Freeze the squished (yes, I'm sure that is a baking term) cookies for at least 2 hours before baking. I got 47 cookies from one batch of dough. The cookies spread a bit and have slight cracking on top. These are small cookies. Rosie makes them about double the size. Spread a thin layer of melted Candy Melts (we bought ours at Michael's) with an off-set spatula. Have sprinkles ready. You need to work fast because the Candy Melts harden quickly (if it does, just re-melt in the microwave). You don't need to cover the bottom of the cookie. 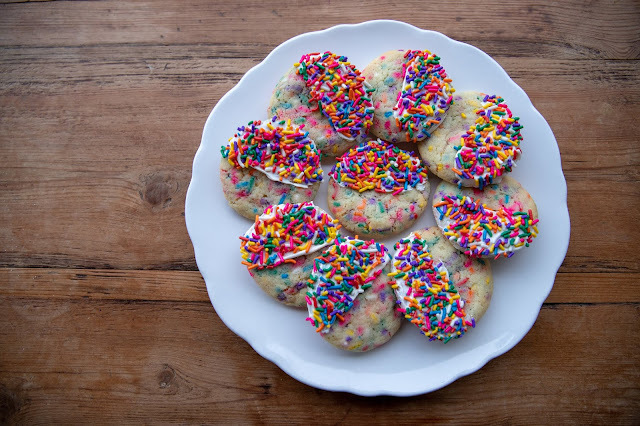 Coat half the cookie with reserved sprinkles. You can adjust the sprinkle colors for baby showers, team sports, holidays, and more. 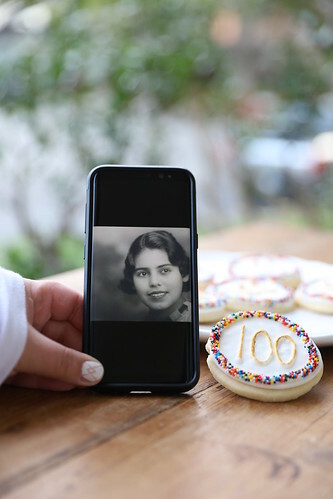 I look forward to making UCLA cookies for a big game! 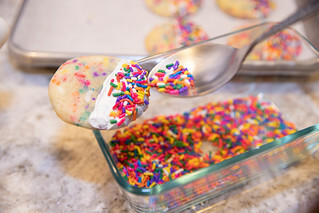 You can skip the top coating altogether and let the colored sprinkles shine through. Thanks Rosie for a great recipe! Thanks Alison, Emily, and Rosie for being the best bonus kids ever! Love, your bonus mom! Prep: In a medium bowl, measure and whisk together flour, cornstarch, and baking soda. 1. In a stand mixer fitted with a paddle, cream butter and sugar. 2. Add egg and extracts until light and fluffy. 3. Scrape down the sides of the bowl. 4. On low speed add in flour, cornstarch, baking soda mixture until just combined, a minute or less. 5. 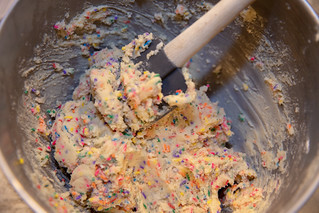 Add sprinkles and beat until just mixed in - or you can do this part my hand. 6. 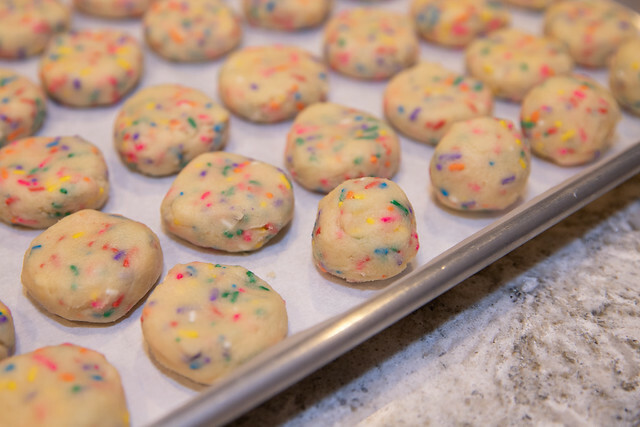 Scoop dough rounds onto parchment paper. Flatten a bit with the palm of your hand. 7. Freeze dough until no longer soft, at least 2 hours. (I froze them overnight). 8. Preheat oven to 350 degrees F. (I have also baked at 325 F on Convection Bake setting). 9. 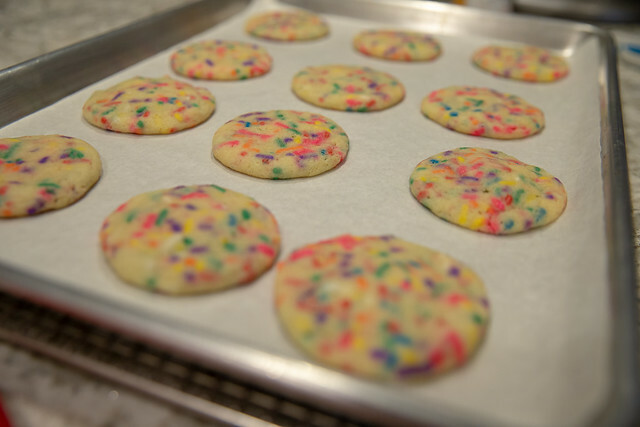 Place cookies on parchment lined cookie sheets, 2 inches apart as they will spread. Bake straight from the freezer. 10. 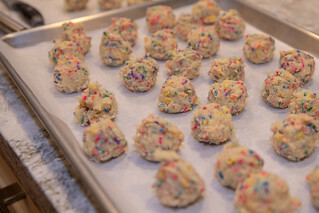 Bake times depends on size of cookie and frozen state - from 8 minutes to 15 minutes. It's a good idea to bake just one or two to determine the best baking time. Mine took about 13 minutes from frozen solid. The cookie will crack on top and the edges should not be brown - they may look underbaked. 11. 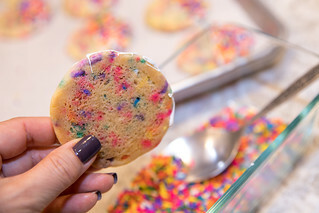 Let cook completely before frosting. 12. Melt candy melts as directed on package. 13. 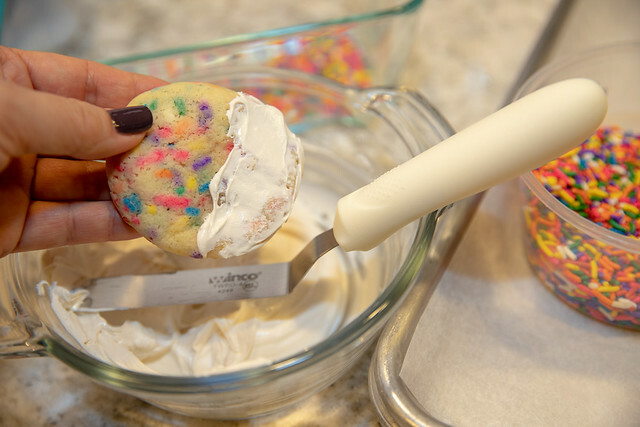 With an off-set spatula, spread a thin layer of candy melt on half the cookie and sides. Leave the bottom of the cookie bare. 14. 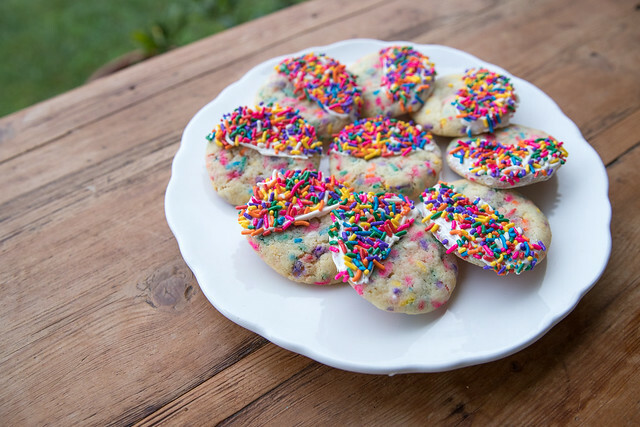 Spread sprinkles on the cookie. Options: You can skip the palm oil in the candy melts and use white chocolate to coat. 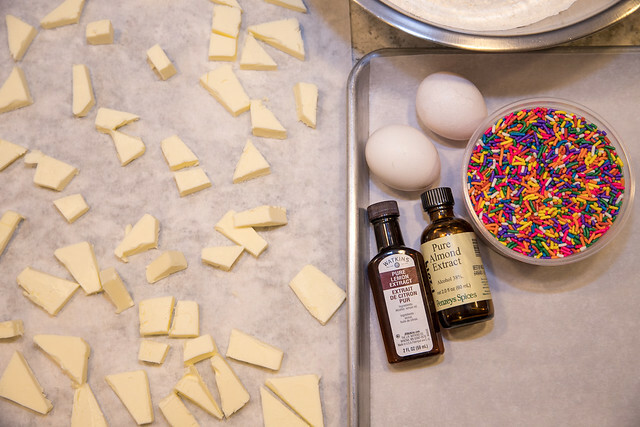 You can also skip the topping of sprinkles altogether. Options: Replace almond extract with vanilla extract. Disclosure: Links to Amazon products are affiliate links. I'll get a few cents if you buy something - there is no cost to you. It's been cold. It's be raining. And it's time for soup! 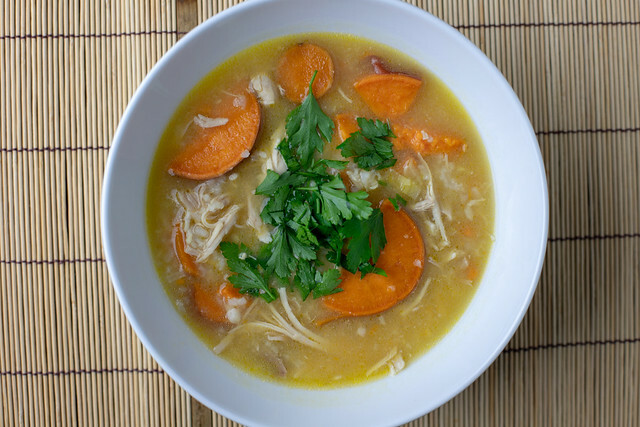 Using the most basic of ingredients, you can make and serve this soup in an hour. And that's a Meyer lemon from my mom's tree. There are 4 garlic cloves and 2 inches of ginger. Man, I love ginger in soup. I used two-ish chicken thighs. 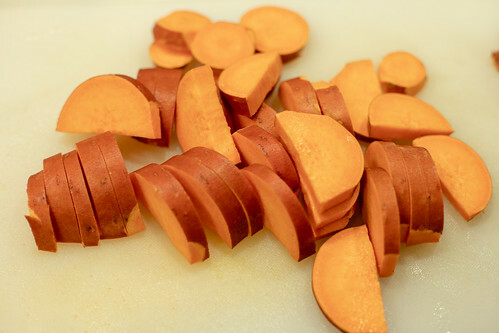 One large sweet potato, with skin on, makes for a yummy change from a plain potato and the color is awesome. 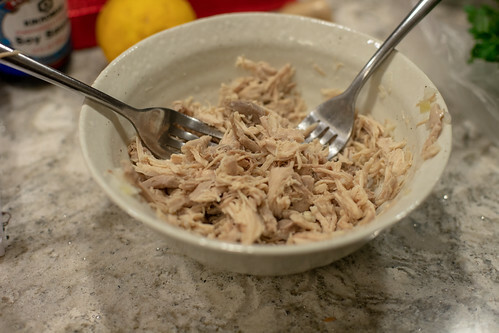 Before serving, shred the chicken thighs with two forks. Super duper easy soup! Right before serving, a couple tablespoons of lemon juice and soy sauce are added. Topped with cilantro, it's way delicious. I served this to a friend who liked it, and another friend made it and loved it. I've made it twice in 2019 and we're only at January 16 so it's hella good. I hope you make this! 1. 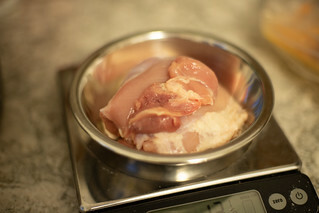 In a large saucepan, bring chicken, rice, garlic, ginger, salt, and 5 cups water to boil. 3. 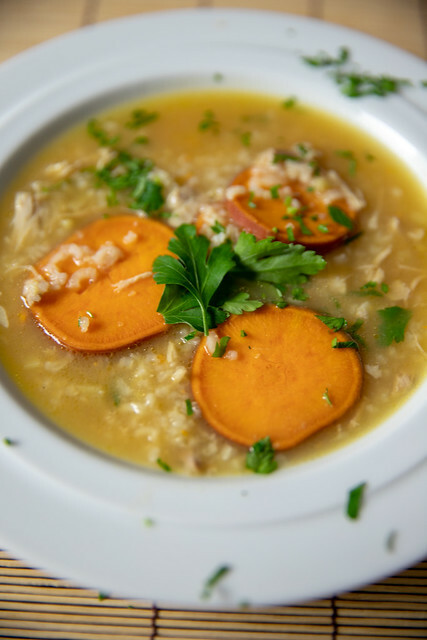 Add sweet potatoes to pan and cook over medium-low heat, uncovered and stirring occasionally, until soup is thickened and potatoes and rice are tender, 15–20 minutes longer. 4. Remove chicken and shred. Return the chicken to the pot. 5. Add lemon juice and soy sauce. Add salt and pepper to taste. Makes enough for 2 large servings with leftovers.